Permissions are key to your integration. They control the kind of data your product can access and whether it is authorized to read or write Nest device data. When you create a client, we'll ask you to choose permissions. Explore the API Reference to see how the data structure and permissions work together. Choose permissions thoughtfully. You can change permissions later, but your users will be notified and asked to accept a permissions update. Choose the permissions that make sense for your product. For products that only check in and get status updates, choose a "read" permission. If your product is designed to set device values or status, choose a "read/write" permission. Key Point: Choose "read" permissions when your product needs to check status. Choose "read/write" permissions to get status checks and to write data values. Ultimately, you want your users to accept and authorize your product. To help users with this decision, you should only choose the permissions that match your product's features. If you choose all the permissions and your product's feature set doesn't match, it can cause users to question whether you can be trusted with their data. Note: Only choose the permissions that match your product features. For more information on changing permissions after you create a client, see Manage Client Version. 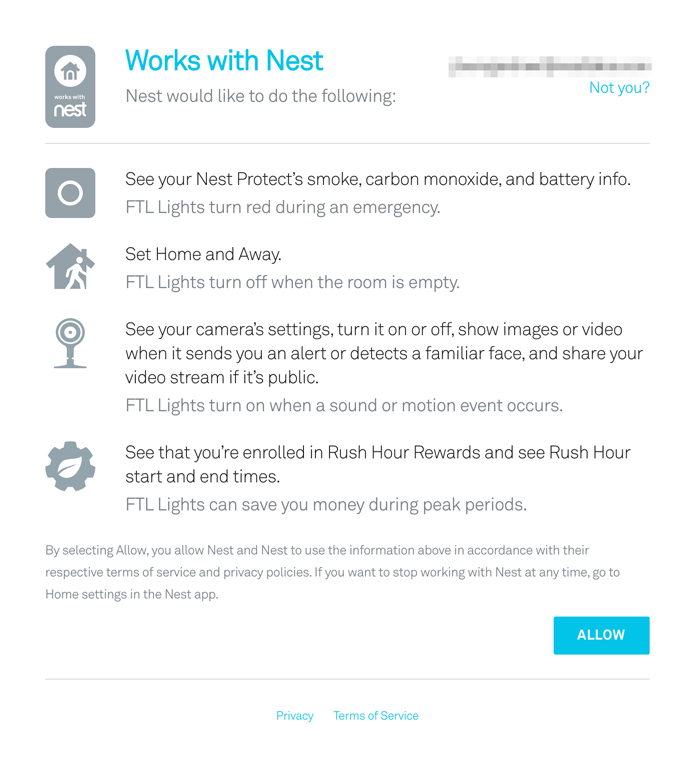 Permission descriptions are user-facing, and appear in the Works with Nest user authorization page and the permissions view in the Nest app. Permission descriptions should explain how your product benefits users. When you write the description, include the client name, what it does for users, and the triggering event. FTL Magic Pathlights dim to save energy when your structure is set to Away. FTL Magic Pathlights illuminate to deter intruders when the Nest Cam Outdoor detects motion. For more information, see the User Experience Guidelines. When we introduce new permissions to the data model, we increment the client version number. To take advantage of these new features, you should update your client with new permissions for the data you want to access. Note: Your users will be prompted to accept permissions before they can use your updated product. If your current client version and the last user-authorized client version are different, your product will need to gracefully degrade to the previous version. Permissions are designed around the types of data access each product might need. The permissions you choose should match the features of your product. Remember that we'll ask your users to agree that your product can access their shared data. Don't ask for more data than your product needs. If you're building a product that listens to temperatures and the Away state of the structure, choose the Thermostat read permission. Conversely, for a product that needs to actively modify target temperature, heat/cool mode, or fan timer, choose Thermostat read/write permission. If your product tracks smoke and CO state, choose the Smoke+CO alarm read permission. If your product uses motion events to turn on a lighting scene. In this case, choose Camera read permission. A different product might use a connected pet activity sensor to send a notification when the dog is active, along with a gif of the dog's activity. For this case, choose Camera read + images permission. When your users are enrolled in the Rush Hour Rewards program, their Nest products change settings to save energy. With the Energy read permission selected, your products can know if a user is subscribed to a Rush Hour Rewards program and when the peak periods begin and end. If your product is focused solely on occupancy, and takes action when the user arrives or after the user leaves, choose Away read/write and ETA write permissions. The following tables describe the access available when you're using the latest permission version. See the API reference for detailed permission information and field availability. Read - View settings on the device. Write - Change settings on the device. Read/Write - Both view and change settings on the device. Images Read (Camera only) - View your camera’s settings, show images or video when there is sound or motion, and share your video stream if it is public. Images Read/Write (Camera only) - View and configure your camera’s settings, turn it on or off, show images or video when there is sound or motion, and share your video stream if it is public.